When considering a kitchen remodel, one of the most important components to consider are the appliances. Appliances range drastically in price and features. Additionally, the location of your appliances is a huge indicator of your overall cooking experience. Two appliances worth noting are the microwave and the oven. Love to entertain? Two words: Double. Ovens. 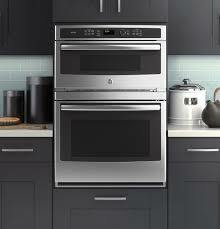 Double ovens are great appliances for the big family that enjoys entertaining together, or even the aspiring chef. A double oven is perfect for preparing a full course meal without having to re-heat side dishes or having to spend all day cooking. While double ovens may be a huge time saver for some; for most families, a double oven will not get used quite as often. Many homeowners with a double oven often find out that the double oven is only used during holidays, such as Thanksgiving and Christmas, where there is more cooking to be done. Otherwise, one oven will typically do the trick. The microwave was introduced to the market in the 1970’s and created a way for people to cook food in less time. They were originally designed to be placed on the countertop. As years went on, many homeowners were hoping to free up counter space and place the microwave elsewhere. Some homeowners started installing microwaves over the cook top. Over the range microwaves are great since they help to centralize some of the cooking process. However, professional ranges require a stronger ventilator. According to Yale Appliance, “The average hood is 24″ in depth whereas the OTR is only 16″. That could be a venting issue on a more powerful range.” Thus, the over the range microwave might not be adequate enough for some more powerful cook tops. A great alternative to an over the range microwave would be to combine the microwave and the oven. It is perfect for those who love to entertain since the cook top, oven, and microwave can be put to use at the same time. Additionally, microwave combo wall ovens typically have the ability to cook as a microwave, convection oven, or both. As a bonus: Since the microwave is now moved from above the cook top, this allows for homeowners to pick out a more eye-catching range hood to accentuate the kitchen’s design style! As you can see, the identity microwave has drastically changed over the years in our kitchens. It has gone from a staple of the counter top appliances, to a built-in add on of the oven. If you have any questions about microwave combo wall ovens, or just kitchen remodels in general, feel free to contact us or give us a call. This is a wonderful kitchen renovation appliance, thanks a lot for the article. I’d like to know the price. Such an alternative to the oven would probably cost a lot of money ! I believe that this is the best choice of equipment for the kitchen. It looks very stylish and very comfortable to work with. Draw guests away by locating your dining seating outside your kitchen. A pass-through window is an effective way of keep your kitchen connected yet delineated. In the kitchen, a kitchen island or bar counter with seating works just as effectively, allowing you to entertain and hang out while keeping guests out of your work space.